Even though Hannah Arendt’s legacy as a political scientist or a philosopher (term which she rejected for herself) is better known for the two books that shaped the common vision of her academic career (i.e., The Origins of Totalitarianism and Eichmann in Jerusalem), these lesser known Essays in Understanding, gathered by some scholars consecrated to her life and work, offer a quite enlightening insight to both her early life and her intellectual inquiries into the ever disturbing subject of totalitarianism, as well as a glance to some writings devoted to other historial or literary issues. In effect, the delicious pages concerning existentialism, some of which were written at the very moment Camus or Sartre were operating their radical innovation of the philosophical panorama in France and Europe, together with a very suggestive interpretation of Kafka’s work or a brief text on the emancipation of women, make of these Essays a work of a varied nature, but do not conceal the overwhelming attention given to the subject which was to always remain the main object of study of Arendt: that is, totalitarianism in its various (political, social, philosophical) approaches. All throughout these texts, Arendt underlines the responsibility of her discipline, political science, in, rather than withdrawing itself to the comfort-zone of the already known categories (tyranny, dictatorship, one-party regimes) of political thought, trying to carry out an accurate description of the functioning mechanisms and the very nature of totalitarianism, which, in its radical novelty, threatened (and still threatens, for that matter) the very foundations of liberal societies. 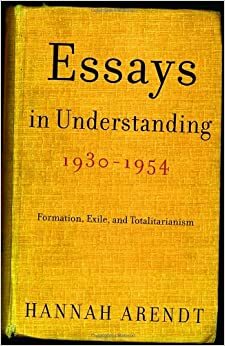 The germs of the various reflections she would later enrich and widen in The origins of totalitarianism already lie in many of these Essays. In this sense, Arendt displays in these works a rather admirable ability: that of consciously rejecting the temptation of trapping herself in sterile and empty denunciations of Nazi atrocities, for instead jumping into the much more troubling, though also much more fruitful, land of investigating the subtle processes and tendencies, both political and social, which may lead to the formation of totalitarian mentalities and totalitarian regimes such as those which reigned in Nazi Germany and Stalinist Soviet Union. While delighting themselves with these pages, the readers cannot but consider that the acute insightfulness of the perceptions and ideas set out by Arendt concerning totalitarianism may be profoundly complemented and enriched, in that silent and implicit collaboration which fiction and non-fiction very usually carry out for the better understanding of reality, by the reading of Life and destiny by Vassili Grossman, for the novel’s almost clinical analysis of the mechanisms and instruments of a totalitarian society are of a immense value to grasp some of the situations and ideas about which Arendt warns so enthusiastically. In effect, Rougemont’s assertion concerning the very disturbing point of suspecting, or even outright knowing, that the seeds of a totalitarian society lie, in one way or another, on each and all of us, condenses the state of mind the reader of these Essays may retain after finishing them; it is in fact a recognition of crude facts which does not obviously offer an easy way out of the danger of totalitarianism, but may nevertheless prove useful in the necessary reflections which should precede every fight against it.